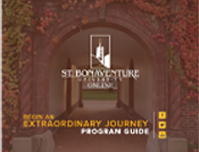 St. Bonaventure University is located in New York state, but its online degree programs are available in several cities across the country including Lansing, Michigan. St. Bonaventure was named one of the nation’s best college values by Kipliner’s Personal Finance. The online Master of Business Administration program is available for Lansing, Michigan residents and uses a 7 week term format, with two terms in each semester. Most enrollees will complete the online degree requirements in approximately 2 years. Students with certain academic backgrounds may be able to complete the online MBA requirements in as few as 20 months. "The two main differences I see in myself as a St. Bonaventure University graduate (compared with others in my field) are that I’m more motivated and I have a kinder spirit. I think the motivation comes from the fact that Bonaventure is a small school. "